Humanitarian Support Foundation is a proud supporter of the Society for the Prevention of Cruelty to Animals (SPCA). 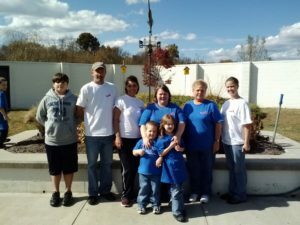 Recently, employees at the company’s Martinsville, VA location lent their time to the local SPCA of Martinsville and Henry County. Volunteers pitched in by cleaning the facility, walking and washing dogs, and assisting in cat socialization. 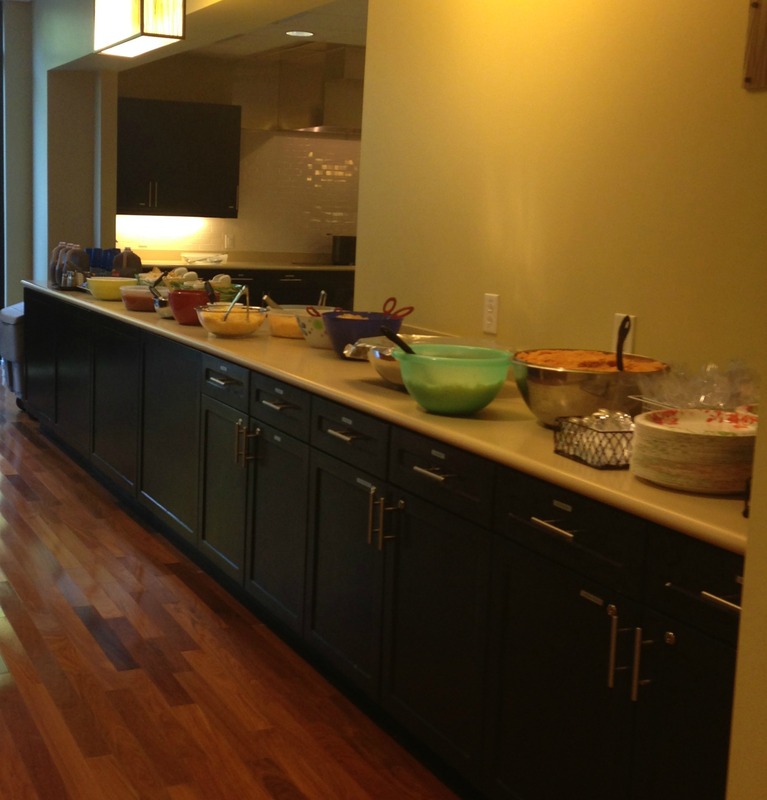 The Atlanta Ronald McDonald House has two locations in Atlanta. One is next to Scottish Rite and the other is by Children’s Healthcare of Atlanta. This remarkable charity provides temporary housing for families of sick or injured children, along with daily meals and support services. Some families come to stay at the house for a night, while others are there for weeks to months at a time, depending on their child’s situation. The House provides a home away from home and helps to lift the financial burden off the families that otherwise would have to stay in a hotel in the area. They are then able to focus on what is really important and that is their child getting better. With everyone having one thing in common, a sick or injured child, the families in the house are able to come toget her to support each other and understand, even in a small way, what each other is going through. Volunteers are a big part of what makes the Ronald McDonald Houses so successful, whether it is cooking a meal, coordinating activities or helping around the house. 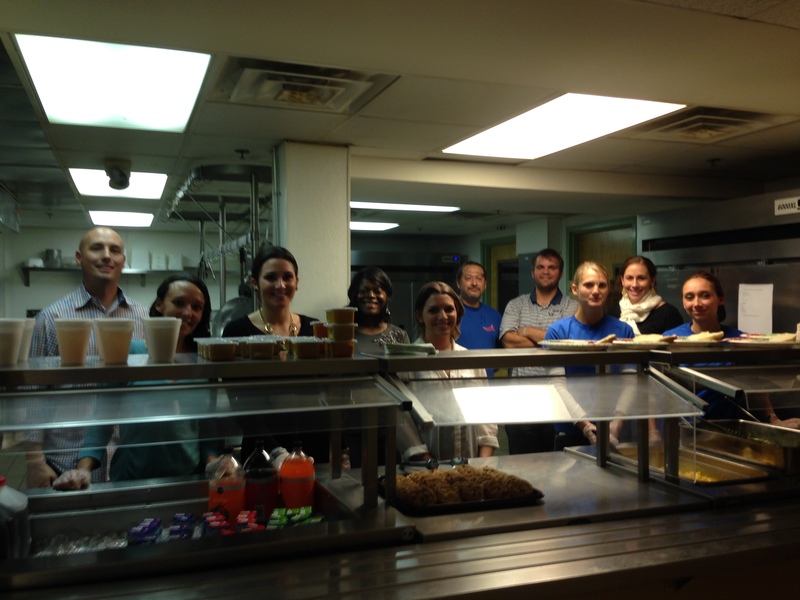 Humanitarian Support Foundation’s Atlanta office volunteered at the Gatewood Ronald McDonald House by cooking dinner for the 50+ people staying in the house. This house has arou nd 50 rooms and has about 80-90% occupancy at any one time. We cooked a Mexican fiesta of fajitas with all the fixings. 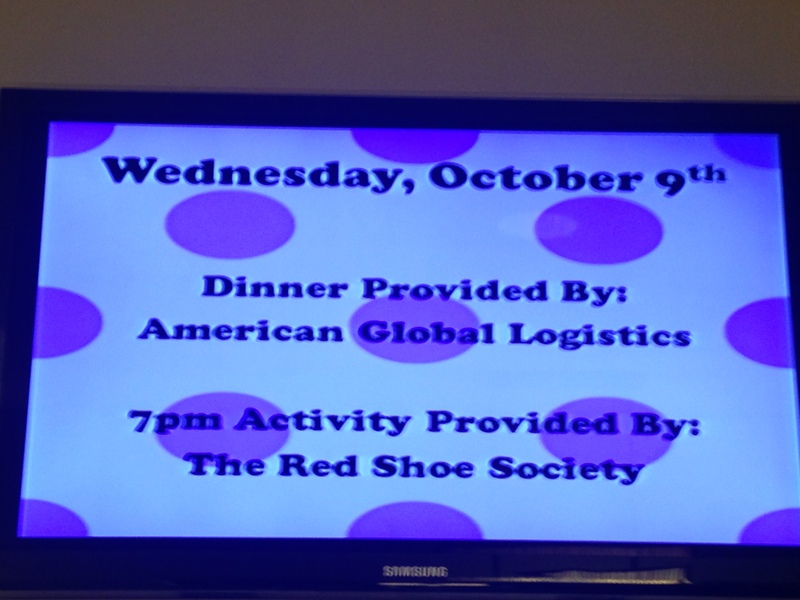 It was a wonderful experience for everyone that was able to participate. It was most rewarding to be able to talk to many of the families and even some of the children that were getting treatment at the nearby hospital. 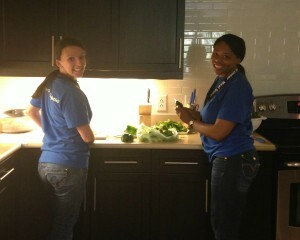 It was fulfilling to be able to come together as a company and provide these families with a home cooked meal. We were touched by their stories. We were unable to personally serve some of the families that were staying in the house because they were at the hospital or at a doctor’s appointment with their child. However, we were pleased to know that they were able to enjoy the meal we cooked for them when they returned to the house later that evening. 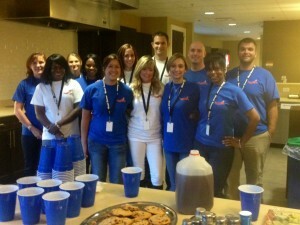 Overall, it was a very rewarding and eye-opening experience for everyone at Humanitarian Support Foundation. The Humanitarian Support Foundation believes in the future, this translates into Humanitarian Support Foundation invests in tomorrow’s leaders / today’s youth. 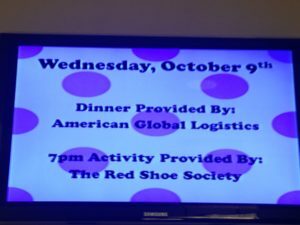 This fall the Humanitarian Support Foundation group sponsored the PSYL Soccer league. 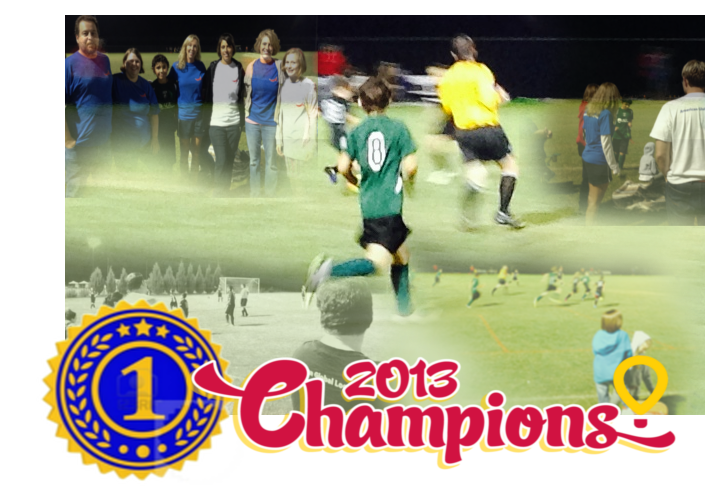 The team, “GlobalCHF Cyclones”, participated in the Fall/Winter season of the PSYL U14 Division. Lead by an outstanding coaching staff and an even better group of kids, the Cyclones claimed the 2013 Division Championship!! Humanitarian Support Foundation is proud to celebrate the accomplishment of these youth. The kids were able to learn teamwork, discipline, and feel the sense of triumph through trial. Today’s youth learning how to be tomorrow’s leaders. 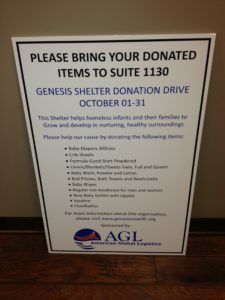 In October, Humanitarian Support Foundation Atlanta sponsored the 2nd annual donation drive for Genesis Shelter in the lobby of our building. We collected boxes of diapers, baby bottles, formula, baby wash, powder and other baby items. We also collected bacterial wipes, hand sanitizers and toiletries. We delivered the items to Genesis Shelter on Monday, November 04 and prepared BBQ pulled pork, chicken with buns, baked beans, mac and cheese and fresh green beans and desert for 40 people. 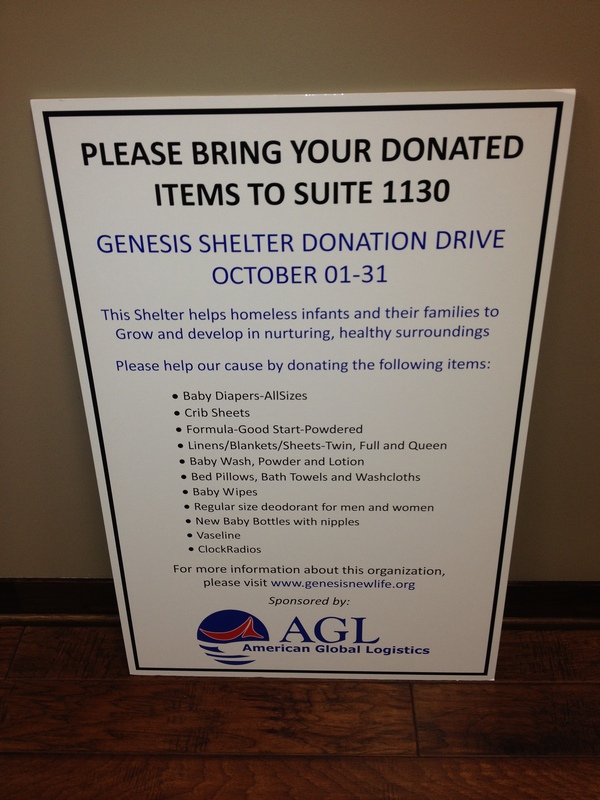 Genesis is a shelter for homeless newborn babies, infants and their families. 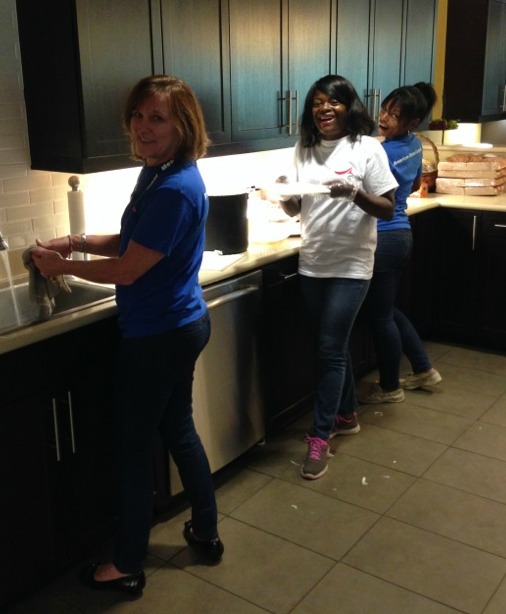 Humanitarian Support Foundation employees are very proud to dedicate their time and support volunteering at Genesis.